How lazy are you? Personally, I’d rate myself somewhere around a 5 on a scale from 1 to 10. I try to do as much from the comfort of my desk chair is possible, which is why I keep a small refrigerator next to my desk. However, I’m not so lazy that I would find a way to go to the bathroom without getting up. I’m also perfectly capable of twisting my own ice cream cone when I eat it. 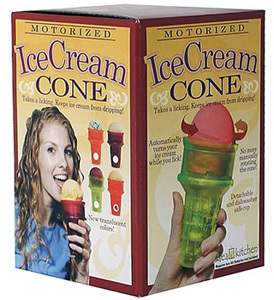 I’m sure that I probably lost you there, but there is seriously a gadget that will rotate your ice cream cone for you. This way you don’t have to bother with actually twisting it on your own. I worry about getting carpel tunnel from typing all day, but seriously, this gadget is just ridiculous. I’m not saying that I look down on anyone that uses one of these, but if I caught one of my friends using it, they would never hear the end of it. There’s one more bit of good news for those lazy people out there. You don’t have to worry about washing it by hand, it’s dishwasher safe. Pick one of these up for your lazy friends for just $12.99.